Here and on Language Log we post every so often on errant apostrophes (and, not infrequently, on non-errant apostrophes, in cases where there’s some variation in the standard and therefore some question about what the prescribed usage should be). Not very long ago I posted a photo illustrating the There’s An Apostrophe In There Somewhere theme (with THER’E for THEY’RE). This entry was posted on April 28, 2009 at 6:37 am and is filed under Spelling. You can follow any responses to this entry through the RSS 2.0 feed. You can leave a response, or trackback from your own site. 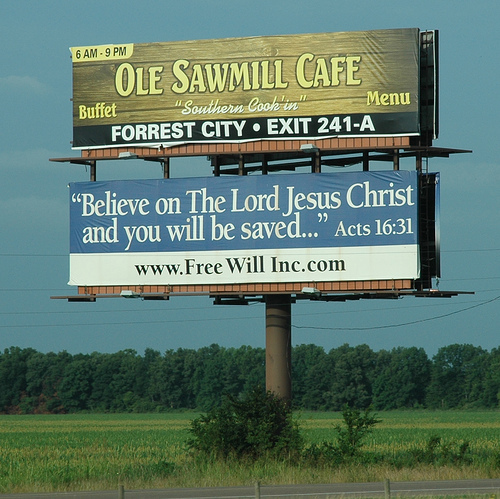 How about the other sign: “Believe on The Lord Jesus Christ . . .”? I should have guessed that the odd preposition came from the King James version. The capitalized “The” on the sign also seemed odd, and, sure enough, it is. When I clicked on your link, I found that it should be lower case. Needing to believe in a savior does not give one much faith in that “Southern Cook’in”. I’d rather have a trustworthy health inspector. Carl N. Karcher got his start in the food industry in 1941 by owning several food stands in Los Angeles, most notably on the corner of Florence and Central in South L.A. By 1945, Karcher owned a stand-alone restaurant in Anaheim, California called Carl’s Drive-In Barbecue. In 1956, Karcher opened the first two Carl’s Jr. restaurants in Anaheim, California and Brea, California; so named because they were a smaller version of his drive-in restaurant. That make perfect sense. I’m a little disappointed, though, that it’s not a quirky as I thought.